So why crinkle cookies? Well, back when I was in high school, my sister and I decided it would be fun to start a holiday tradition of baking cookies for the holidays. Sugar cookies were too boring for our tastes and chocolate chip cookies were too common. We had no idea what to make that would be easy and good. When we looked in the pantry, there was a box of Devil's Food cake mix sitting there and my sister asked if we could make some cookies using it. 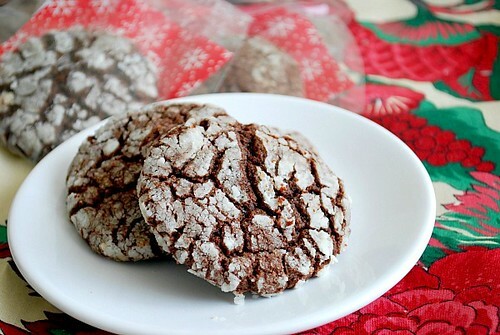 Then to our surprise, printed on the box was a recipe for Chocolate Crinkle Cookies. Five ingredients was all that was needed - a box of cake mix, some vegetable oil, 2 eggs and powdered sugar. We were skeptical at first but after the first batch, we were sold. Ever since then, the crinkle cookies were our special holiday cookie. 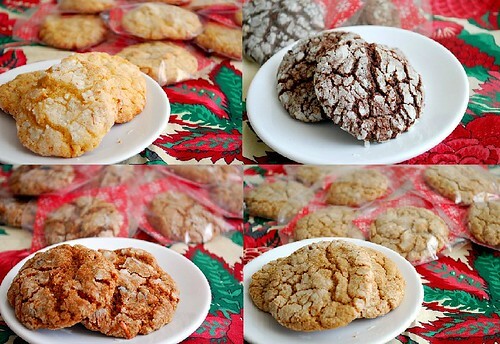 This year I made 4 kinds of crinkle cookies using 4 different cake mixes - Devil's Food, Caramel, Apple Spice and Carrot Cake. Each one came out beautifully and friends loved them. I'm pretty sure my co-workers will enjoy them too! Feel free to use whatever cake mix flavor you prefer... but Devil's Food is definitely my favorite. I haven't tried this recipe using any gluten free cake mixes but I plan to. If you happen to give it a try with a gluten free cake mix, please let me know how they came out! In a large bowl, combine the dry cake mix, oil and eggs. Mix together with a wooden spoon until fully combined. Shape dough into 24 evenly sized balls. Place the powdered sugar in a small bowl and roll the dough balls in the sugar to coat. Place the powdered balls of dough onto an ungreased cookie sheet. Bake the cookies in the preheated oven for 8-10 minutes to set. Remove from oven and allow to rest for 1 minute on the cookie sheet before transferring to a wire cooling rack. This is such a great idea. I love crinkle cookies with the powdered sugar, I really like how you change up the flavors here. Spice cake would be yummy. 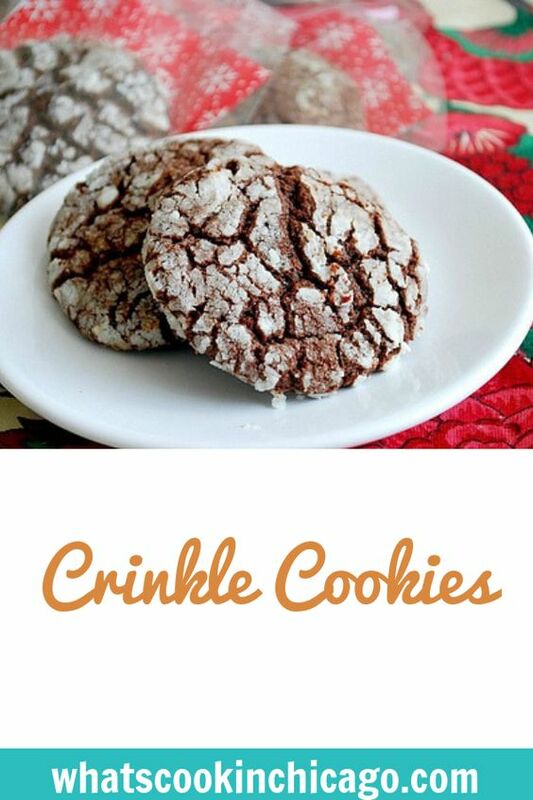 I am definatley adding these to my Christmas cookie baking rotation. Love the simple ingredient list.... I am probably only going to do the devil's food cake version because who doesnt love chocolate! I think I just found my final quick and easy cookie recipe for coworker gifts this Christmas! Thank you! I make some very similar to this that are too die for.....all my co-worker's beg for them. and then roll the dough in powdered sugar. 350 for 10-12 minutes. The cool whip gives the cookies such a light, fluffy texture. No No. This cookie is to good to use a cake mix out of a box. Do it from scratch or not at all!!! As a newly wed in the '60s I tried the recipe for Chocolate Crinkle Cookies from the Better Homes & Gardens cookbook I received as a shower gift. They are so delicious, but more labor intensive than your version. I look forward to trying your version. I have looked for this recipe for a long time. I have fond memories of these too. But we add chopped nuts to the batch and dust w cocoa powder or hot chocolate mix. Yum ! I have a 12 month old and don't have a lot of time to make cookies this Christmas so I think I'm going to make these for cookie exchange parties! Thanks for the idea! I made red velvet crinkle cookies to add to the holiday cookie plates, and they look so festive!